Person County Center will be closed tomorrow, Fri 04/19/2019 for the holiday. April 2019 Hemp Meeting Update! What is Cooperative Extension in North Carolina? The North Carolina Cooperative Extension is a partnership involving the United States Department of Agriculture, state and county governments, and our two land grant universities: North Carolina State University in Raleigh and North Carolina A&T State University in Greensboro. Its mission is to help people improve their lives through an educational process that uses scientific knowledge based on issues and needs. 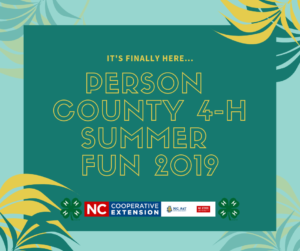 The Cooperative Extension helps people gain new knowledge and put it to work in agriculture and natural resources, home economics, 4-H and youth development, and community and rural development. These programs help people identify problems and find solutions to improve their homes, families, farms, businesses and communities. The Cooperative Extension provides useful, research-based information and non-formal learning opportunities. This information is available to all North Carolinians through extension agents and staff in each county and with the Eastern Band of Cherokee Indians. County personnel are supported by a staff of subject matter specialists at both universities. How Can Extension Help You? Extension agents and staff members are there to help you by providing information and non-formal learning opportunities. A wide variety of programs are offered for urban and rural residents; youth of all ages; individuals; traditional and non-traditional families. Listed below are examples of programs available through the Person County Center. In response to current social, economic and environmental issues, the Cooperative Extension has developed nine initiative programs that focus on practical resolutions for today’s North Carolinians. Looking for a specific person? Try the Person County Center Staff Directory, or the Full Directory for N.C. Cooperative Extension.